A stove fueled with biomass – twigs, sticks, pine cones, scrap construction wood etc – just makes sense. 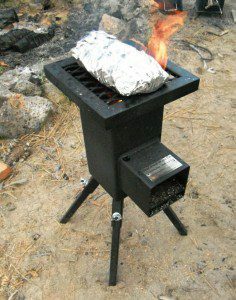 The Deadwood Stove is a prime example of why you should consider adding one to your prepper/survival and outdoor needs. Disclaimer: The following is my opinion. At the time of this article’s publication, Deadwood Stoves was not an advertiser of SurvivalCommonSense.com, nor was there any remuneration for this review. I’m into biomass stoves, and from the responses and feedback, so are you readers! So far this year, I have built one such stove out of 16 bricks, tested the Solo Stove backpacker, the Ammo Can, the EcoZoom and now the Deadwood stove. There are a lot of reasons why a biomass stove makes a lot of sense. In emergencies, and in the aftermath of a disaster, the ability to purify drinking water by boiling water may be critical. For that, you need a container and an efficient heat source. You really don’t want to run out of fuel! The fuel aspect alone rules out heat sources that depend on propane, charcoal or other commercial products. Weight: For us baby-boomers, cutting weight we have to carry is not optional anymore! Any stove, no matter how lightweight, must also have fuel. With a biomass stove, fuel weight is out of the picture. Environmental: A well-designed biomass stove is fueled with whatever is available. The fuel source could be pine cones, twigs, sticks, dried animal dung or whatever. A good stove will produce very little smoke because of its efficiency, and will use remarkably little fuel. Burning biomass reduces your carbon footprint and dependence on fossil fuels. Cost: A quality biomass stove is a one-time investment, and there are no operating costs. The last time I checked, a gallon of Coleman fuel at the local Wal-Mart was about $10! No matter what you initially spend on a stove, fuel cost to operate it should be a consideration. The Deadwood Stove Company is located in Valera, Texas, and is family-owned and operated. When I called the company to inquire about the stove, the phone was answered by Dan Warren, one of the owners. He and his brother, David Warren, designed the stove and make it themselves. Their warehouse is in Texas, and the company provides jobs for American workers. The story of the Deadwood Stove Company is classic Americana: Dan and David have always liked metal working, and fooling around with designs of things. They came up with the biomass stove design a few years back, figured out the best way to make it, applied for a patent then formed a company to produce and distribute the product. Height without the leg extensions = 14.5 in. Height with leg extensions = 21.5 in. The grill surface = 8.5 in. X 8.5 in. Footprint with leg extension = 11 in. Footprint without leg extensions = 7 in. My first impression out of the box was that the stove is well-made, by people who obviously take pride in their work. Joints are tight, the welds are smooth and there are not any sloppy or rough finishes. The stove is finished with smooth, black high-temperature paint. The legs fit inside the combustion chamber, making for a compact, easy to haul combination. But pretty doesn’t mean something works well. I got the stove just before heading out to a Wilderness First Aid training camp-out weekend for Boy Scout adult leaders. It was a perfect testing opportunity – if there is a greater group of outdoor gear heads than a bunch of scout masters and volunteers, I don’t know what it would be! Over the course of the three-day event, I cooked everything on the Deadwood. Lighting it was a snap: Flip back the grate, light some fire starter and toss it in the chamber, and throw in some twigs and sticks. In a few minutes, there will be a fire ready to cook over. I cooked foil wraps, grilled a salmon burger, made coffee twice and in general, used the stove for everything you’d use a stove for at a camp-out. The Deadwood performed really, really well. Foils wraps are easily cooked on the Deadwood Biomass Stove. There was another biomass stove from another manufacturer at the camp-out, so we set the stoves up side-by-side. Both stoves performed extremely well, and it was easy to pick up enough sticks to fuel both of them. The legs raise the Deadwood to a comfortable level (21.5 inches) to cook on. I didn’t spend a lot of time cooking long-simmering dishes, but if I had, I would have appreciated not having to bend over all the time. The Deadwood was easy to light. There is a special slot in the back of the combustion chamber for sticking a lighted match through, and that could make ignition simpler. The grill worked great for cooking a salmon burger. There’s no reason it wouldn’t work equally well for grilling hotdogs, hamburgers, steaks, brats, etc. Fuel the Deadwood with some hickory or other hardwood, and it would make a superb grill. I got home from the first aid camp-out in time to leave the next day for a fishing float trip on the Central Oregon John Day River. The Deadwood went along. Circumstances dictated that the Deadwood didn’t get used. But the stove was tossed in the back of a pickup full of gear, bounced over 20 miles of unimproved dirt roads, and ended up riding home in the floor of a pontoon boat. The Deadwood is compact, easy to carry and extremely rugged. Because it is easy to pack, and there was no fuel to haul, the Deadwood will go along on the next raft trip. After testing the Deadwood in these different circumstances, I highly recommend the stove. It has a place in your camping, prepping and/or survival gear. That’s where my Deadwood is going. 2 Comments on "Product Review: The Deadwood (Biomass-fueled) Stove"
Heading over to check it out now and shared! 🙂 Thanks Stephanie!